I have been working in the Gallowgate area for the past few month,s and during my lunch hour, i have been having a wander with my camera , i have walked down this street many times but the other day i noticed this large carving/artwork on the front of one of the tenement,s on this street, that i just had never noticed before . it feature,s a range of images that you might associate with bread making , sheaf,s of wheat , a flour sack ? and various farming tool,s . so was there ever a bakery based on this street , or a wheat merchant,s warehouse . it is as you can see a very large carving/artwork , so i can only imagine that there must have been a pretty big business based there at some time in the past . i did a search on Hunter street and found no mention of this carving . "Further W, just into HUNTER STREET, a fine red sandstone ashlar tenement (nos. 202-04) by Monro & Son, 1903. The fine trophy of agricultural implements refers to the potato and seed merchants' warehouse to which it was originally attached." That's the answer to your question, I think. I see that Jas D Galloway sign every day on my travels to work from the train. (Good one for the 'signs' post too!) The North Clyde line to be exact. Just out of interest does anyone know what that big piece of waste ground used to be between the sign and the railway? I noticed that theres an ond building still standing, you can't see it very well from maps.live.com but it looks like an old signal box. Also just at that part there looks to be an old line which branches off and goes into a tunnel under the current line. Had a look at the tunnel post and can't work out if its on the map or not. 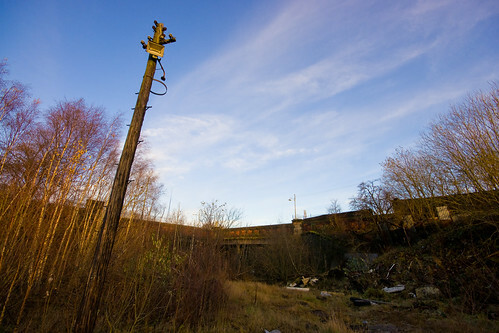 That could be the old line down from High St to Bridgeton Central - wouldn't evidence of the old Gallowgate Central station on this line be around the vicinty as well? Don’t know this part of the planet very well but still did a nosey with the old maps. The 1912 map shows all the stations on this part of the Gallowgate. The 1890’s maps show more close-up details. Might help you guys work out where is what? Yes it,s an old signal box , or what remains of one , here is a pic . and Anorak thank,s for those map,s . it makes it much easier to understand the layout of the area . Another good pic, still not bad condition as the basic structure is all still there. Funny that even neds of a bygone age still like to torch stuff. Always amazes me how detailed some of these old maps are, to the point it lists the buildings and what their purpose actually was! Where did you find the old maps Anorak, are they online? the (lifted)line seems to come off near sydney street, curve under barrack st. into the blank area. anyone know what was here? 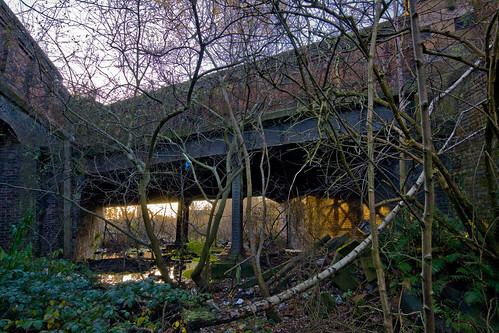 The Bridgeton Central branch line is the one that heads south-east down to Bridgeton Cross - it's a series of tunnels and open cuttings. The open land behind the old Great Eastern Hotel is the North British Railways College Goods Yard - the goods shed wall is still standing further along Duke Street. Right behind the hotel was a roller-skating rink! Also in this area is the Molendinar Burn, which goes under the goods yard on it's way down to the Clyde. 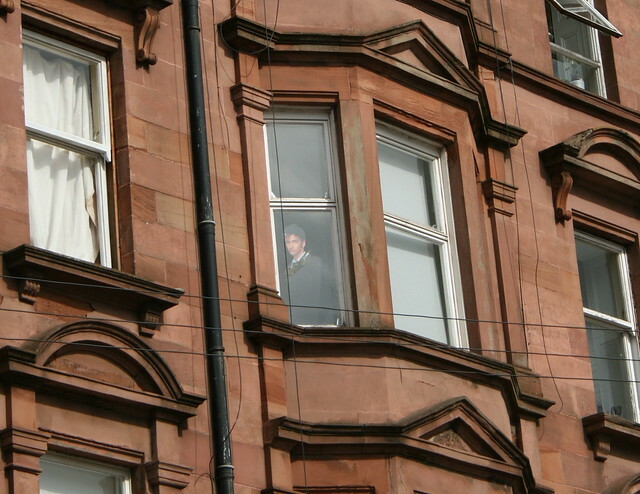 Excellent - Dr Who sure beats Paddington Bear on Hyndland Road! theres a billy connolly in my hoose. Thanks for sharing the very well preserved carving. Pity about the white pointing , but otherwise superb. I used to visit a couple of city centre offices around St Vincent and Bath St with amazing views out over all the hidden roof top and window list details, hidden from most of us scuttling about below. I see there is a 'Greek' Thomson project which will probably will have loads of such like. Shall take a butchers in that thread.